February is American Heart Month. Did you know that heart disease is the number one cause of death and illness among men and women in the United States? And that’s not all: Heart disease kills more women than all cancers combined! Heart disease occurs when plaque builds up on the walls of the arteries to the heart. The arteries become narrow and blood flow to the heart is restricted. Many factors contribute to heart disease including age, gender, family history, smoking and obesity. The good news is a healthy diet and exercise can decrease your risk. The most common symptom of a heart attack is chest pain or discomfort. The level of pain can vary from mild to severe, and may feel like squeezing or heavy pressure, or even indigestion. Other symptoms can include anxiety, shortness of breath, dizziness, nausea or sweating. If you have symptoms of a heart attack, call 911 immediately. Don’t wait! Getting help right away is crucial to reduce your risk of sudden death. Though you can’t control some risk factors (such as age, gender or family history) there are plenty of steps you can take to avoid heart problems in the future. Don’t smoke or use tobacco: Smoking damages your heart and blood vessels. As your arteries narrow, your heart rate and blood pressure increases, forcing your heart to work harder to supply enough oxygen. Women who smoke and take birth control pills are at an even greater risk of heart attack or stroke. Exercise regularly: Physical activity helps control your weight and can also reduce stress. Try to get 30 minutes of exercise each day. Too busy? Studies show that even 10-minute sessions offer heart benefits, so get moving! 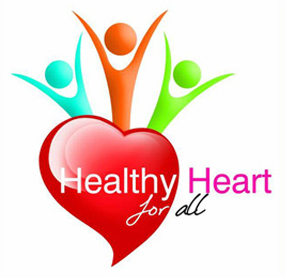 Eat a heart-healthy diet: Eat foods that are low in fat, cholesterol and salt. Look for low-fat sources of protein, such as fish that contain heart-healthy omega-3 fatty acids. Add more fresh fruits and vegetables to your diet, and include whole grains and low-fat dairy products. Maintain a healthy weight: Excess weight can lead to high blood pressure, high cholesterol and diabetes, which increases your chances of heart disease. Measuring your waist circumference is a good way to tell if you are carrying extra abdominal fat, which puts you at greater risk for diabetes. Men are at risk if their waist measurement is greater than 40 inches. Women are at risk if their waist is greater than 35 inches. Make healthy choices a lifestyle and inspire others to do the same. Your heart will thank you!